36 month lease on approved credit available only to qualified customers at Walter’s Mercedes-Benz of Riverside through Mercedes‑Benz Financial Services (where applicable to advertised lease) through 4/30/19. Advertised lease rate based on a gross capitalized cost of $57,753. Includes destination charge and P1 package. Excludes title, taxes, registration, license fees, insurance, dealer prep. and additional options. Total monthly payments equal $23,724. Cash due at signing includes $3,299 capitalized cost reduction, $795 acquisition fee, and first month’s lease payment of $659. Total payments equal $27,818. Subject to credit approval. No security deposit required. 10,000 miles per year with $.25 per mile in excess. $0 Security deposit. 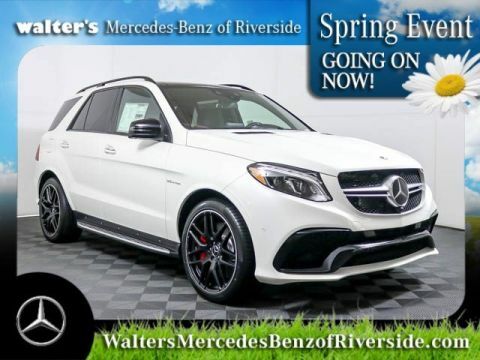 SUV capability ascends to luxurious heights in the 2019 Mercedes-Benz GLE and is complimented with an abundance of lease specials and finance offers. Compared to the last year’s models, the cabin on the 2019 Mercedes-Benz GLE gets roomier on a wheelbase that is three inches longer while augmenting agility and aerodynamics for more responsive handling. To help improve fuel efficiency and minimize wind noise, understated spoilers enrich the tire surrounds, rear window, and tail lights. Create a special mood inside the cabin with 64 colors of the available LED ambient illumination. Special motifs can muster a sequence of multiple hues for special effects. 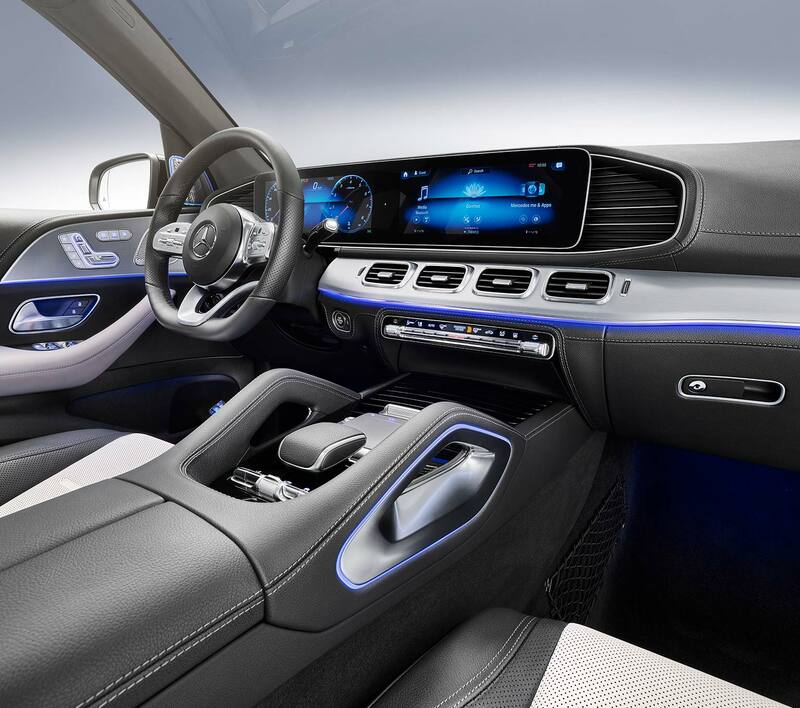 At the cutting edge of human-technology interaction, the Mercedes-Benz User Experience relies on artificial intelligence to listen, learn, adapt, and respond to your commands. It works with the touchscreen, Bluetooth® streaming, and touch-sensitive controls to allow for convenient cockpit control. It understands natural language voice commands, such as by adjusting climate control when you say “It’s cold in here.” You can create multiple profiles of different settings and then save groups of settings as moods or themes. The entire system then updates itself as needed on the air. To soothe you with a spa-like experience every time you get behind the wheel, available ENERGIZING Comfort integrates massage, seat ventilation, and heating, ambient light, and sound. This option can subtly infuse fragrance into the cabin air that has been purified by ions, so all your senses are refreshed. Elevating your engine experiences is the 9G-TRONIC automatic transmission. Its larger range of ratios and shorter gear steps allow for quicker gear changes, especially when initiated by shift paddles. DYNAMIC SELECT varies shift programming, throttle response, the Electronic Stability Program, and other systems, based on your choice of four preset modes with ECO emphasizing fuel efficiency, Sport amps up handling and responsiveness, Comfort balances assertiveness and economy, and Off-Road takes you on trails full of dirt, sand, and gravel. To help you conquer any natural or man-made surface, 4MATIC® intelligent all-wheel drive interfaces with the Electronic Stability Program and the 4-wheel Electronic Traction System. When grip starts to slip, the system delivers torque to the wheels with the most traction. Road adherence then remains strong even when the going becomes slippery or uncertain. If you’re looking to this vehicle as transportation for your loved ones, you’ll be reassured by all the built-in or available protective systems. They begin with Active Brake Assist, which depends on radar-based technology to determine if a collision is likely with something or someone in front of you. When you respond by braking, this feature can adjust braking effort to prevent an accident. It can also engage braking if you do nothing. you require immediate assistance? Then push a button to be connected to a Mercedes-Benz Emergency Call agent who can send first responders to your location. Parking in reverse gets easier with the rearview camera that reveals a high-resolution image of what’s occurring behind you. You can choose between wide-angle or 180-degree views. Turn on Active Parking Assist to automatically locate parallel or perpendicular parking spots as you drive by. Once you’ve chosen a space, this technology steers, shifts, and brakes to guide the SUV into your chosen area. Available driver assists take an active role in keeping you out of danger. Active Blind Spot Assist can detect vehicles entering the blind zones on either side of you. It warns you audio-visually and, if you try to change lanes, brakes individual wheels to keep you in your current lane. Active Lane Keeping Assist prevents you from drifting across roads and freeways by first alerting you with a vibrating steering wheel. If you do nothing, it can guide you back to safety with braking maneuvers. Active Speed Limit Assist automatically modifies your cruising speed to match posted speed-limit signs. 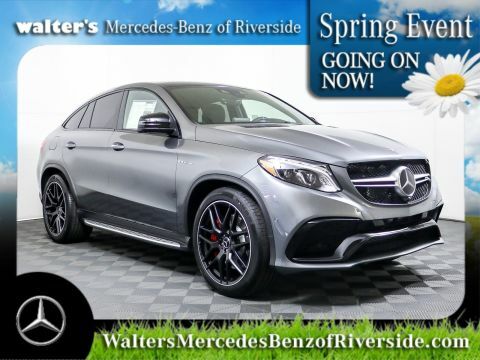 2019 Mercedes-Benz GLE 350 4MATIC®: The 2.0-liter inline-4 turbo depends on high-pressure Direct Injection and rapid-multi-spark ignition to generate 255 horsepower and 273 lb.-ft. of torque while accelerating from 0 to 60 MPH in 7.1 seconds. To reduce fuel consumption, the driver- switchable ECO-START® system turns off the motor when you idle or stop. Move your foot off the brake and the engine immediately restarts so you get the best acceleration response. The power liftgate opens and closes through a switch on the driver’s door panel or with a button on the SmartKey remote. MB-Tex upholstery covers the seats with its leather-like feel, easy-care, and outstanding durability. An upgrade to sumptuous full-grain leather is also available. Another upgrade adds multi-contour seats to the front. They come with eight massage settings, including two that duplicate the hot stone efforts you get at full-service spas. If you choose to keep all seatbacks up, the remaining 38.2-cu.-ft. cargo space can be shielded from prying eyes using a luggage cover that retracts with one hand. Push a button to open or tilt up the tinted glass sunroof. Another touch engages the express feature to fully close or open the roof. Block out the sun’s glare by closing the manual sunshade. 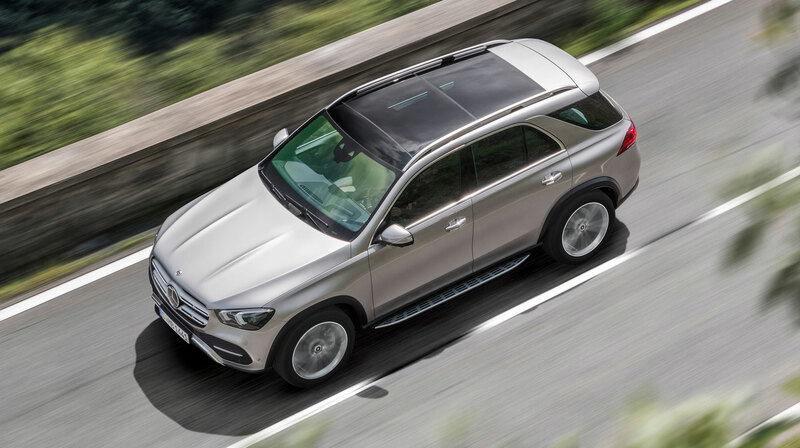 2019 Mercedes-Benz AMG® GLE 43: AMG® enhancements to the 385-horsepower 3.0-liter Biturbo V6 achieve up to 384 lb.-ft. of torque and a 0-60 launch of a mere 5.6 seconds. The lightweight diecast-alloy motor relies on Variable Valve Timing, Direct Injection, and rapid multi-spark ignition to boost both performance and efficiency. The AMG® Performance 4MATIC® all-wheel drive splits the torque at 40:60 from the front to the rear to improve handling dynamics. With the AMG® programming of the 9G-TRONIC transmission, Manual mode allows for very fast gear changes through the aluminum shift paddles. Find out how you’re driving with the Illustrated Vehicle Display that reveals your vehicle incline and steering angle in degrees, the balance between the front and rear torque, and the DYNAMIC SELECT mode. The AMG® Sport Exhaust System matches the signature AMG® sound to your expectations. When you’re going on a relaxed Sunday cruise in a quiet neighborhood, the engine plays a subdued note. Rev up for acceleration or passing and the tailpipes emit a beast-like growl. KEYLESS GO® lets you leave the key fob in your pocket or purse as you lock and unlock doors by touching a door handle or start the motor by stepping on the brake pedal and pushing the Start Engine button. 2019 Mercedes-Benz AMG® GLE 63: Hand-crafting by a single technician distinguishes the AMG® 5.5-liter Biturbo V8 that pushes 0-60 acceleration to 4.2 seconds. Behind the thrust are 550 horsepower and 516 lb.-ft., guaranteed by the master who signs the engine. The AMG® SPEEDSHIFT® PLUS 7G-TRONIC transmission assists with the EPA-estimated fuel economy of 17 MPG on the highway and 13 MPG in the city. To tighten cornering maneuvers and control the leaning of the body, the ACTIVE CURVE SYSTEM varies the roll stiffness of the electro hydraulically variable stabilizer bars in the front and rear. You can further sharpen the stabilizer responsiveness by engaging the Sport mode of DYNAMIC SELECT. The optional AMG® Dynamic Performance Exhaust acknowledges your driving efforts with powerful sounds. Growls and rumbles then accompany maneuvers like revving up the throttle, upshifting, and downshifting. The AMG® High-Performance Braking System allows for powerful stops with more speed and less heat through internally ventilated and perforated discs at all four wheels. Silver- painted six-piston fixed-type calipers grasp front discs measuring 15.4 inches in diameter. In the rear, the silver-painted single-piston floating calipers hold discs measuring 13.6 inches. Inside the cabin, sporty interior appointments include contoured front seats and brushed-aluminum pedals studded in rubber. The flat-bottom Nappa-leather-wrapped performance steering wheel features thick padding and multifunction controls, so you never lose hold of the steering wheel when managing the most frequently used automotive functions. 2019 Mercedes-Benz AMG® GLE 63 S: The top performer of the line jumps from 0 to 60 MPH in an astounding 4.1 seconds, propelled by the 577 horsepower and 561 lb.-ft. of the hand-built AMG® 5.5- liter Biturbo V8. To proclaim your road prowess, the AMG® Sport Exhaust System varies its timbre from the pleasant subtlety of an easy cruise to the roaring acknowledgment of higher revs from the four chrome tailpipes. Welcoming you to the track-inspired cabin are the brushed-aluminum door sill inserts with backlit AMG® logos. Grab hold of the Performance steering wheel that’s clad in Nappa leather and DINAMICA microsuede. Pedals with rubber studs highlight sure-footed control on brushed aluminum. Three years of Mercedes me Connect Services offers remote access to your vehicle. Through an app that you download to your smartphone, you can start the motor, lock and unlock doors, locate the vehicle after you park, and track it if it is stolen. You also get 10 years of Assist Services, which lets you schedule service at your dealer from the app, obtain service quotes, and add the service reminder to your calendar. Your vehicle can send diagnostic data to your dealer or download updates over the air. To maximize your entertainment choices, you get a six-month All-Access trial of SiriusXM® Radio, which access over 150 channels of exclusive talk, live pro and college sports, and commercial-free music. 40/20/40 split. Those rows also power adjust in six ways for more comfort. The outer seatbacks power- fold to make entering and exiting the third row easier. In the front, the seat-shaped switches control how you personalize the power seats, which include four- way power lumbar support. Store up to three different personalization in memory, which also accepts the positions of the side mirrors and power steering column. Dual-Zone Automatic Climate Control customizes front-row comfort by allowing for separate left and right temperatures. An optional three-zone version adds personalized temperature controls for occupants in the back. 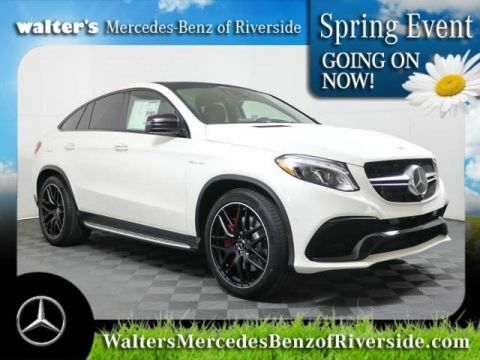 The style is in the eye of the owner so the 2019 Mercedes-Benz GLE lets you personalize the exterior with one of 10 or more colors that includes designo® Cardinal Red metallic, Brilliant Blue metallic, or Polar White. You can also choose wheels ranging from 19 to 21 inches in such finishes as Multi-spoke Black or Twin Five-Spoke. 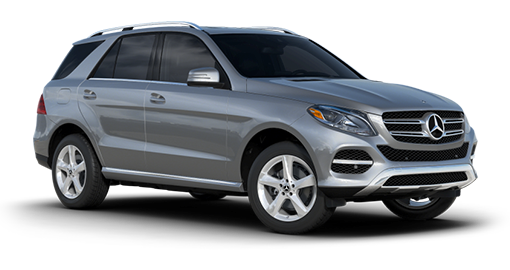 Upgrading your look, even more, is the AMG® Line Exterior Package, which comes with or without the Night Package. To ensure instant illumination that copies daylight more faithfully than xenon versions, LEDs grace the headlamps, Daytime Running Lamps, tail lights, and other external illumination. The Advanced Tire Pressure Monitoring System lets you know if any of the wheels has suffered a drop in tire pressure. It also shows the numeric pressure for each mounted tire on the multifunction display. As soon as moisture drops on the windshield, the rain-sensing wipers automatically switch on. The rear window wipers follow suit or can also activate when you shift into Reverse. 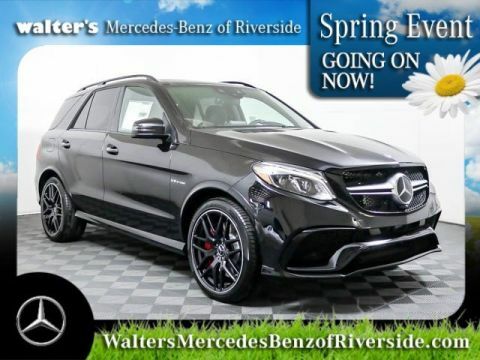 Come to Walter’s Mercedes-Benz of Riverside today to lease a new 2019 Mercedes-Benz GLE SUV. 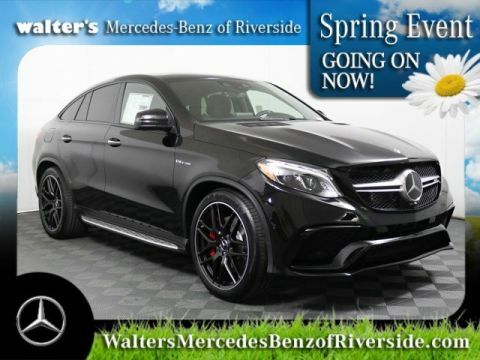 We have the new 2019 Mercedes-Benz GLE for sale, and you can ask us more about your Mercedes-Benz lease and finance options!